To work with creative people is a tremendous gift. Days filled with questions, searching for explanation and understanding. Social commentary, expressing the human condition, taking what’s inside and churning it out, exploring, defining, soothing, infuriating… nothing is off limits for the artist’s probing perspective. To be a creative thinker is to be at once an artist, sociologist, listener, observer, explorer, imaginative and brave. Oh yes, brave. Whether you are the most celebrated recognized artist or create without audience or support, the personal dilemma can be the same; ‘who am I to write, or compose, or draw, sculpt, paint… why is my story unique or worth telling’. The colleagues I have been working with have faced this inner struggle and have found their voices. It’s a challenge to believe in your unique perspective. 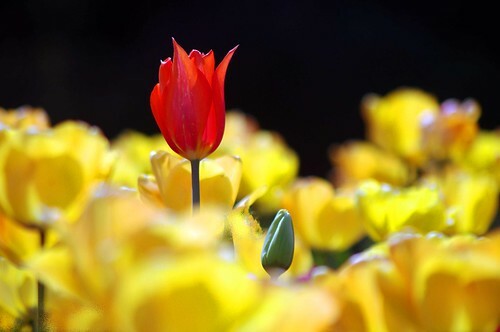 Being a red tulip in a garden of yellow can be, well, uncomfortable. Or absolutely stunning. Ralph Waldo Emerson wrote: To be yourself in a world that is constantly trying to make you something else is the greatest accomplishment. My inspiration for the next phase of work will be from the creative minds that challenge me to look beyond the obvious, think of possibilities and believe in the sound of my own voice. During a time in which hearts are heavy and the world continues to spin at a chaotic pace, at a time in which I’ve made one of the most crucial transitions of my life, as grey wintry clouds lay low and rain patters the busy city street…this picture made me smile and gave me a renewed sense of hope. Perhaps it is the vivid imagery. Or the lone, red tulip standing tall amonst the crowd. Whatever it is about this picutre, it gave me a sense of renewed inspiration.